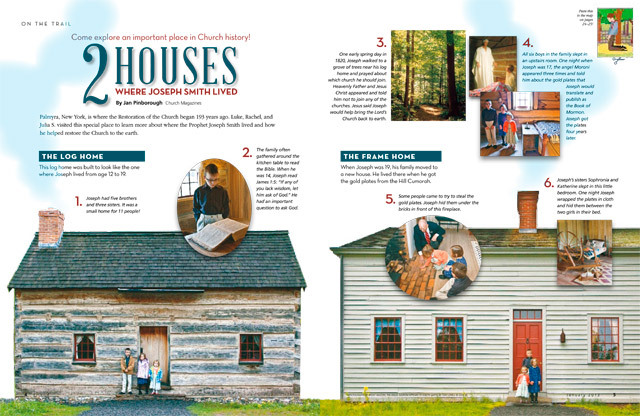 Come explore an important place in Church history! Palmyra, New York, is where the Restoration of The Church of Jesus Christ of Latter-day Saints began 193 years ago. Luke, Rachel, and Julia S. visited this special place to learn more about where the Prophet Joseph Smith lived and how he helped restore the Church to the earth. This log home was built to look like the one where Joseph lived from age 12 to 19. 1. Joseph had five brothers and three sisters. It was a small home for 11 people! 2. The family often gathered around the kitchen table to read the Bible. When he was 14, Joseph read James 1:5: “If any of you lack wisdom, let him ask of God.” He had an important question to ask God. 3. One early spring day in 1820, Joseph walked to a grove of trees near his log home and prayed about which church he should join. Heavenly Father and Jesus Christ appeared and told him not to join any of the churches. Jesus said Joseph would help bring the Lord’s Church back to earth. 4. All six boys in the family slept in an upstairs room. One night when Joseph was 17, the angel Moroni appeared three times and told him about the gold plates that Joseph would translate and publish as the Book of Mormon. Joseph got the plates four years later. When Joseph was 19, his family moved to a new house. He lived there when he got the gold plates from the Hill Cumorah. 5. Some people came to try to steal the gold plates. Joseph hid them under the bricks in front of this fireplace. 6. Joseph’s sisters Sophronia and Katherine slept in this little bedroom. One night Joseph wrapped the plates in cloth and hid them between the two girls in their bed.